I have spent my career working in Kanazawa, a place where traditional culture like the tea ceremony and townscapes featuring historic machiya houses can still be found. It was in this quaint old setting that our contemporary art museum was established, and here I have long curated exhibits of today's artworks. In the process, I have also encountered the local traditional culture and been electrified by what it has to offer. At times, these cultural experiences have nimbly transcended the boundaries set by the museum as a modern Western institution. The first time we called on Takahiro Iwasaki to show his work was for an exhibition held at a vacant machiya in Kanazawa. Machiya are traditional wooden townhouses designed so that breezes can pass from the front entry to the inner garden. 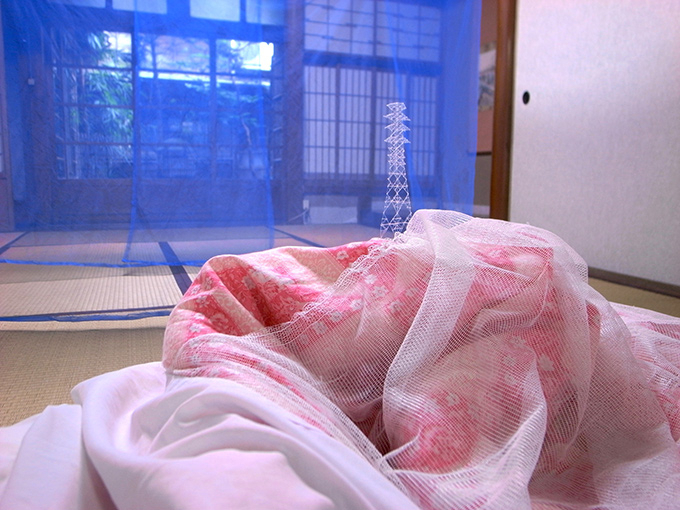 The exhibition was held in the summer and Iwasaki created a piece featuring a blue plastic mosquito net in a tatami rice-mat room. The voluminous exhibit had a striking effect in the narrow, low-ceilinged room, but it did not block the flow of the air nor one's view. It was a work that matched the season, something often forgotten in contemporary art. The former resident of this home was a man of letters, and an effortlessly executed ink painting was on display in an alcove. 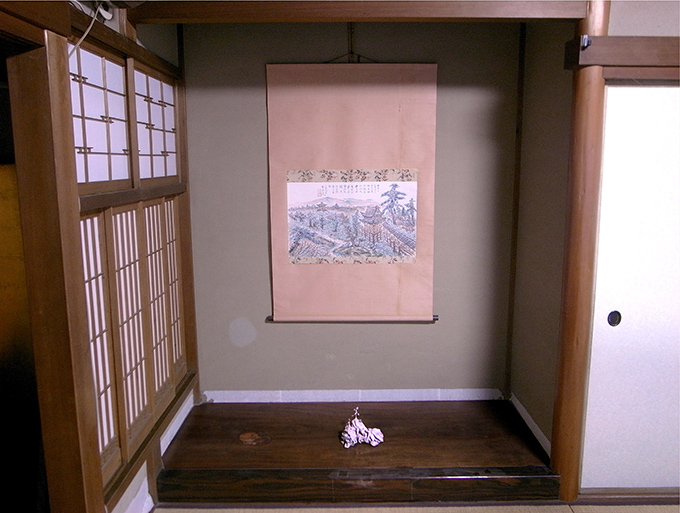 When Iwasaki saw a blackened dust cloth used to clean up the old house, he spontaneously crinkled it into the shape of a rock and placed it in the alcove. At first glance this mass appeared to be a garden stone, but closer inspection revealed the fiber of the cloth, making it look more like a pine tree, which was juxtaposed with the pine trees in the painting. 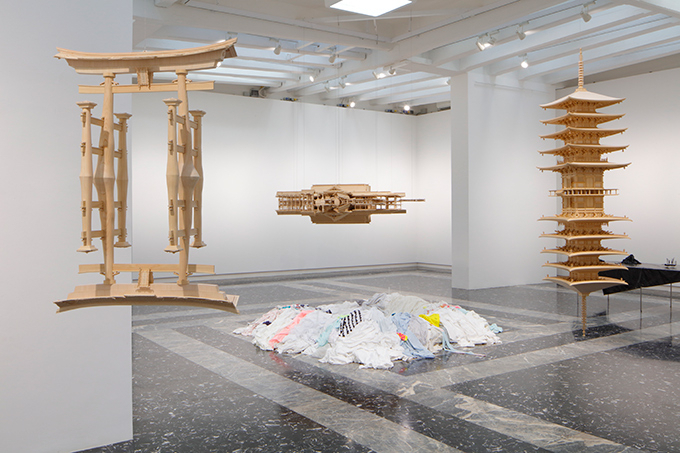 Recognizing Iwasaki's ability to respond to context and bring out the value of Japanese tradition through both motif and method, I chose to feature him at the Japan Pavilion of the Biennale di Venezia. 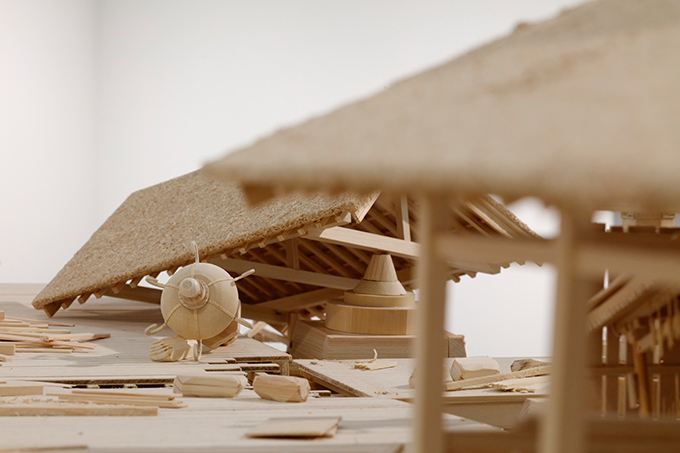 This year's Biennale di Venezia included an exhibit based on the motif of Itsukushima Shrine, a Shinto shrine on an island near the city of Hiroshima. Titled Reflection Model, this three-dimensional work perfectly recreates the reflection on the surface of the water visible at the actual shrine. The Itsukushima Shrine represented in this work is in a considerable state of disrepair, which is also accurately reproduced in the reflection. Why did Iwasaki choose this dilapidated form? Iwasaki was born and raised in Hiroshima and continues to live there, using it as the base for his creative activities. He says there is a strong contrast in the methods of preservation for two structures, specifically Itsukushima Shrine and the Atomic Bomb Dome (Hiroshima Peace Memorial). Itsukushima Shrine, situated on a beach, is not a building that has suffered typhoon damage only once or twice during its lifetime. Rather, it has been damaged and rebuilt countless times since its original construction in the Heian Period (794-1185), a process by which its form has gradually transmuted into the shrine we have today. To protect the main hall from the destructive forces of waves and powerful winds, other buildings have been placed closer to the ocean to absorb the brunt of storms. This resulted in the repeated destruction of those outer areas over the centuries, which provided carpenters with the opportunity to hone and pass down their skills during the repair work, and encouraged the continued cultivation of the timber needed to replace broken structures. In contrast, the Atomic Bomb Dome has been preserved in its damaged state as a monument to suffering, and reinforced so that no further damage occurred over the 70 years since. This method of preservation is similar to that used in art museums, where humidity is controlled at great cost, and works are put on exhibit for limited periods to prevent excessive exposure to light. These efforts are made to prevent decomposition of the materials from which the artworks were created. Maintaining the same material conditions and form ensures the identity and authenticity of the artwork, and gives rise to the work's aura. However, in the case of Itsukushima Shrine, its parts have been gradually updated with each repair. Every part of it has likely been replaced during its 1,000 years of history, and thus almost nothing is left of the original construction. 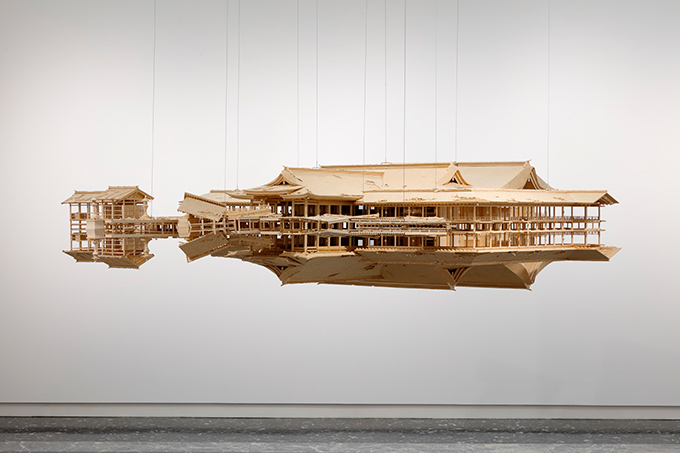 Iwasaki added the subtitle Ship of Theseus to Reflection Model based on the motif of a deteriorated Itsukushima Shrine. This name comes from Theseus's Paradox from ancient Greece, which asks whether a ship can be considered the same ship if all of its parts have been replaced. Perhaps it can be said that Itsukushima Shrine has been preserved in an Eastern manner of coexistence with nature, as opposed to the Western or art museum approach of manually intervening to preserve the original state against naturally occurring changes. This relationship between man and nature captured Iwasaki's interest. The rediscovery of the traditional values of the East is an important theme for many of Iwasaki's works, though not necessarily for all of them. I believe this theme is particularly necessary to present to the primarily European audience of the Biennale di Venezia. During the private showing, people stopped me and asked if I was Japanese as I toured the other pavilions, exclaiming that "the Japan Pavilion was wonderful!" Local newspapers chose to focus on the Japan Pavilion, along with those of Germany and France. The curators of the other pavilions were impressed by the immense handwork involved, and praised the exhibit for its humorous touches as well. As the curator in Kanazawa, I hope to continue this rediscovery and communication of the traditional values of the East through contemporary art. 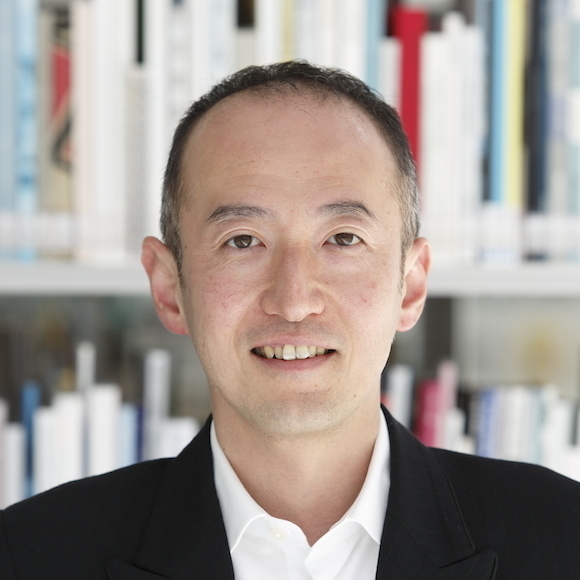 Curator at the 21st Century Museum of Contemporary Art, Kanazawa, was born in Kyoto in 1973. He holds a Master of Art History from the University of Tokyo. He curates exhibitions of contemporary art and architecture with an emphasis on community involvement. His leading projects include Kazuyo Sejima + Ryue Nishizawa / SANAA (2005), Atelier Bow-Wow (2007), Jeppe Hein (2011), solo exhibits by Shimabuku (2013) and Mitsunori Sakano (2016), and the Kanazawa Art Platform 2008 group exhibition, all held at the 21st Century Museum of Contemporary Art, Kanazawa. He is the curator of the Japan Pavilion of the Biennale di Venezia 2017.